Good day my friends! October is National Cybersecurity Awareness Month. So as Summer reluctantly turns to Fall let’s stop and think about keeping our digital lives safe on the Internet. The National Cyber Security Alliance (NCSA) has some great information about how to stay safe online and how to keep your business secure, too. Cyber security is no joke, just ask Equifax (too soon?). The NCSA has some great, easy to follow advice on handling Spam and Phishing, Malware, botnets and Ransomeware. They also list basic safety tips when shopping online – and we all like to shop online. For the business owners out there, you haven’t been left out. NCSA covers a lot of information about identifying and protecting against risks. They even provide an extensive list of free online security check up tools. Do everything you can to reduce your online footprint and know when NOT to click that link. 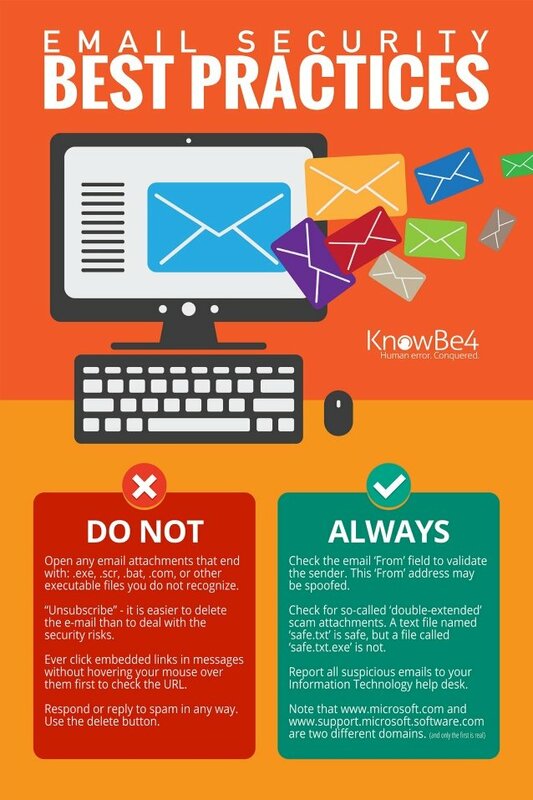 The graphic above from our partner KnowBe4 (www.knowbe4.com) gives some great tips to keeping safe online. So NetData friends near and far, please think before you click. If you have any questions, please drop us a line or give us a call. We take this stuff very seriously and want to help you any way we can.